1. FOOD In order not to burden our brave, grad-student sitter, Tim, I'm preparing most of my kids' meals. I visited the grocery store last night while the girls were at dancing class. Essential staples purchased Sunday night were dwindling, so I stocked up. This morning I almost kicked someone when I noted that only a few bananas remained on the counter top. I still suspect a renegade green pepper might be hiding out in the back of the fridge where lost items avoid my groping, searching hands. Rather than empty my least favorite appliance, I added 'green pepper' to my last minute list. 2. LAST MINUTE GROCERY RUNS So . . . in the freezing weather, I joyfully loaded the tots I sit for into the 'great white' (our 12 seater Chevy Express van) and hit my favorite hang out- the Jewel (our local grocery store). 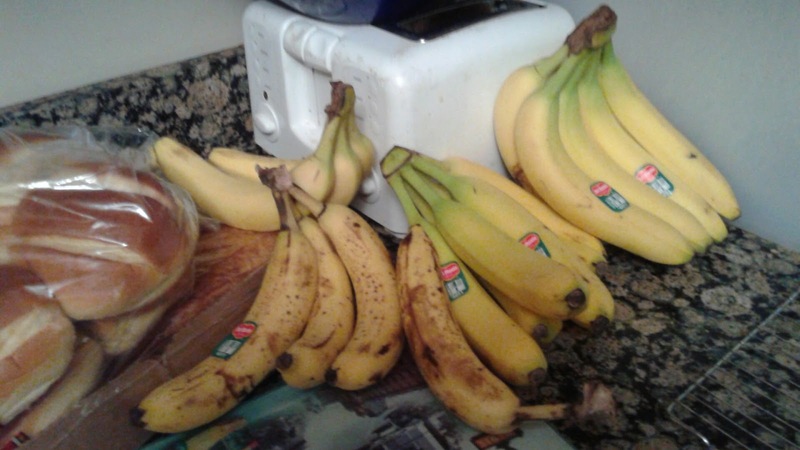 Now there are enough bananas gathered in front of the toaster to satisfy a family of apes. Before I diced up tot size lunch offerings, I chopped up the correct proportions of onions, green peppers, and garlic to brown with the meat for my crowd-pleasing chili recipe. 3. CROSSING FINGERS THAT EVERYONE DOES WHAT THEY ARE TOLD I enjoyed this same trip last year when I tagged along on Coach's fellowship course. Surviving the dizzying logistics necessary to peel myself away from our brood and all of my commitments was a challenge then, too. I still recall the jarring phone call from my Mom when she suspected that Laddie's car was in the cul-de-sac after he was supposed to have departed for a friend's house. Mom arrived at our house to lock the interior doors. We hoped to avoid any teenager nonsense on the days when the kids scattered to friend's houses. I whispered into the phone, 'Mom, he's still in the house!' It was like a daytime thriller except no one's life was threatened. Instead, Laddie risked long term house-arrest for hiding out in the basement and not following THE PLAN. 4. ARRANGING SLEEPOVERS The kids begged to once again be allowed to sleep at a friend's house for one of the nights we are away. 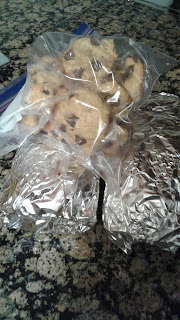 After breaking my own self-imposed rule of never-invite-yourself-over, I feel compelled to bake treats. Before I hop in the cab for the airport, I will arrange in plain view labeled, pre-wrapped tin foil packages of my infamous cookies and pumpkin bread for the sleepover-imposers to drag along with their overnight bags. 5. CLEANING THE PIT OUR HOUSE Our sitter, Tim, used to sit for us when he was in high school. As a toddler Curly was crazy about him . . . still is. He's been around forever, but I still feel compelled to clean the abode before I ask him to sleep here for three nights. Not everyone is capable of snoozing surrounded by stacks of unsorted laundry, baskets of mismatched socks, and boxes of well-loved books the kids recently agreed to donate. Being able to relax despite the chaotic explosion that exists in most rooms of our home is a gift. Crockpot of chili surrounded by extra milks. 6. DINNERS In my spare time, I've managed to fill two crock-pots: one with chili (with a good portion of green pepper! ), the other with pizza casserole. They are stored precariously at the edge of the shelf in the basement fridge. Here's hoping someone remembers to plug them in on the necessary morning. I will be sending up a small prayer that no one reaches in to grab a new gallon of milk and knocks one of them over. 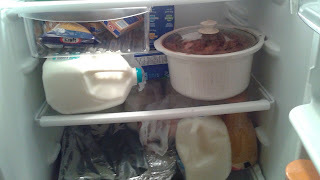 Leftovers of other meals I prepared for this week will also be available 'just in case.' Rounding out my menu plan during our trip is an envelope of cash that will provide the gang with a rare pizza treat during the Superbowl. 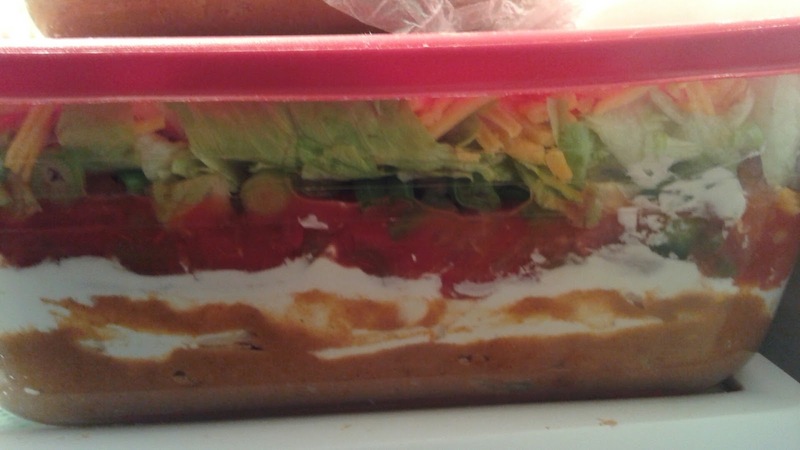 7 layer taco dip - YUM! How many minutes till they dive into this? 7. SUPERBOWL SNACKS Although the absence of parents is probably celebration enough, I have agreed to prepare my infamous 7 layer taco dip so that the kids, Tim, and Tim's girlfriend might still enjoy the traditional annual football experience. 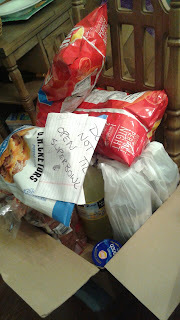 On a chair in the dining room, there is a box full of other store bought snacks, drinks, and dips. I labeled it, so no one messes with it until game time. Yeah, right. I crack myself up sometimes. 8. ARRANGING FOR REINFORCEMENTS Since Tim needs to get to his job before most of my offspring are out of bed, my Mom and Coach's office manager are taking turns playing the role of the sensible adult on the two school mornings when I'll be gone. A revolving door of take-chargers ought to be interesting. 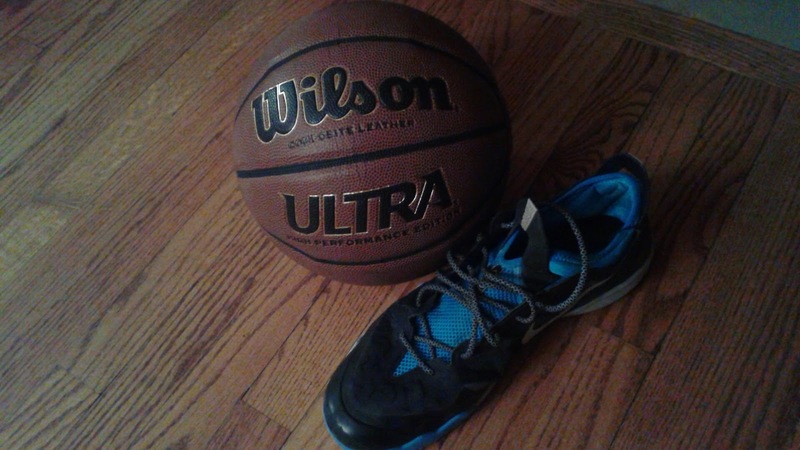 Basketballs and sneakers - everywhere! Is that the laundry room floor? 9. RIDES Then there is the transportation dilemma. In order to avoid having Tim crisscross the western suburbs of Chicago, I've scored the kids rides to most of their activities. In a word: basketball. Between the five kids residing with us full time, they are playing on 8 different basketball teams. 10. 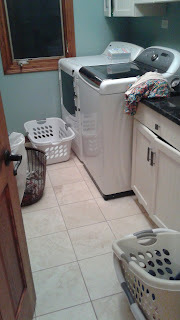 LAUNDRY I may be squeezing lots of tasks into a small window to prepare to head out of town, but my washer and dryer have been working double time. I refuse to hear about missing jerseys, favorite jeans, or a lack of socks. 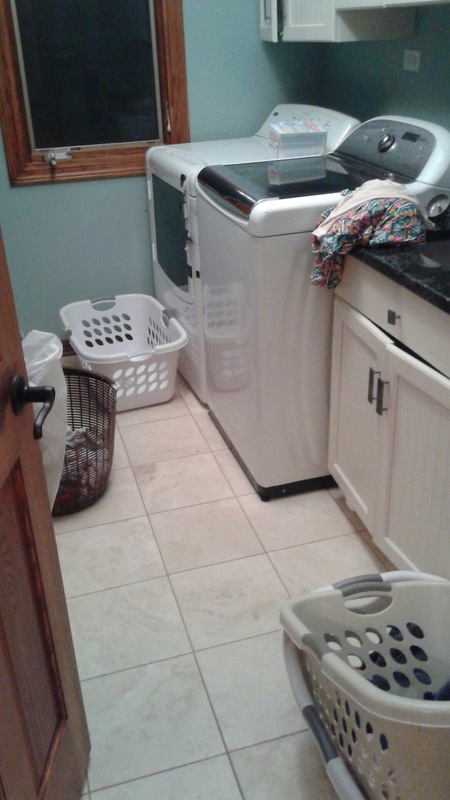 My laundry room is clear. Momentarily. It looks as if we are preparing for an open house. I cringe when I think of the heaps of smelly basketball clothes that will await my return. 11. ANYTHING COACH DIDN'T DO Coach has organized some of his own clothes to pack. His 13 month old laptop that he needs during his fellowship course died inexplicably this week, so he had to contend with that. Otherwise, he is anxious to get away and spend some alone time with me after his course ends at the end of each day. Not surprising, he is completely clueless as to the organization that is required to keep this ship running in our absence. Now, if I can just find some time to pack.